The rose burns out on its calyx. I never met Louis Le Brocquy, but from an early stage he was a very important lighting-rod in that part of my ‘appearance’ in this world that could be considered ‘artistic’. I am not entirely certain when I first became aware of him as an artist but I remember that while in secondary school, between 1968 and 1974 I had the privilege of being taught by a craft and technical drawing teacher called “Artie” McManus. Instruction in whatever medium was being taught: lithograph, clay sculpture, stained glass etc. was always combined where possible with exposure, hence trips to make stone rubbings of the entrance stone of New Grange or the high crosses at Clonmacnoise; seeking out Harry Clarke stained glass windows wherever they could be found or Jack B Yeats at the National Gallery. 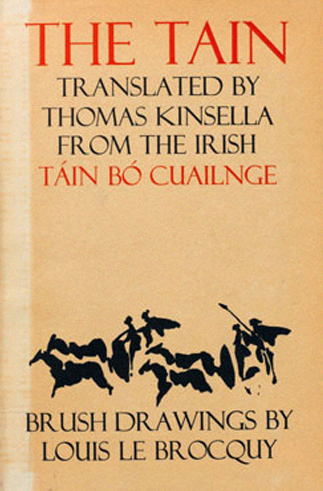 In 1971 there was an exhibition of Le Brocquy paintings as part of ROSC ’71 The Irish Imagination 1959-1971. I think it was at the Dawson Gallery and this might have been included in a ‘field-trip’ from school. 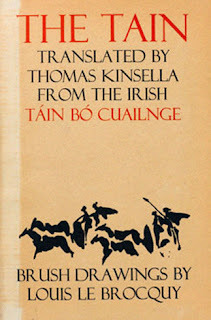 Equally the first exposure could have been the Dolmen Press’ book Tain Bo Cuailgne translated by Thomas Kinsella and illustrated by Le Brocquy and given to me as a present in about 1972 because of my interest in Celtic mythology. In any event the impact of Le Brocquy’s Tain drawings, and then Ancestral Head series of an open-mouthed cry bewailing the Northern Irish troubles or later of his Portrait Head series, particularly of Beckett and Yeats, always held me spellbound with a real desire to perhaps one day own one of his works. An opportunity to do this arose in January 1997. 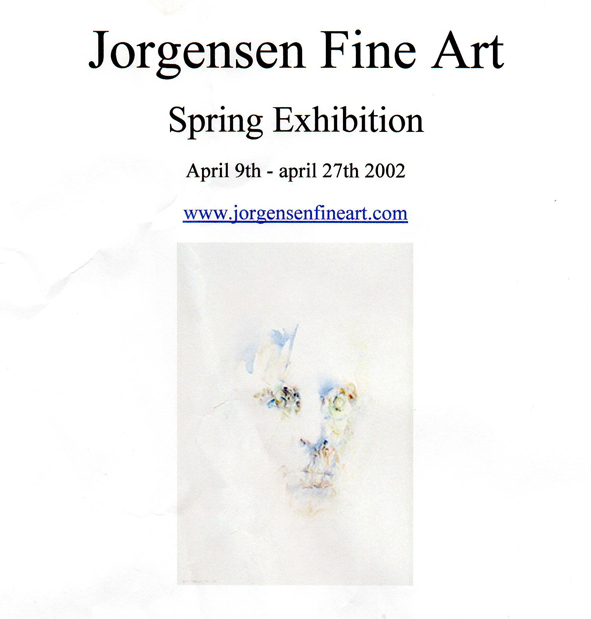 While walking along Molesworth Street to attend a meeting at the nearby Royal College of Physicians in Ireland, I had a little time to spare and decided to check out the gallery run by Ib Jorgensen in a house that previously served as his haute couture atelier. This fact alone intrigued me and after gaining admittance I walked around the gallery under the watchful eye of an immaculately coutured woman in black. 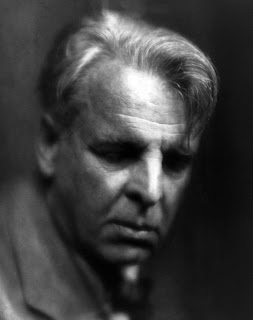 While climbing the stairs from the ground to the first floor gallery I came across a Le Brocquy watercolour of William Butler Yeats and could not take my eyes off it. 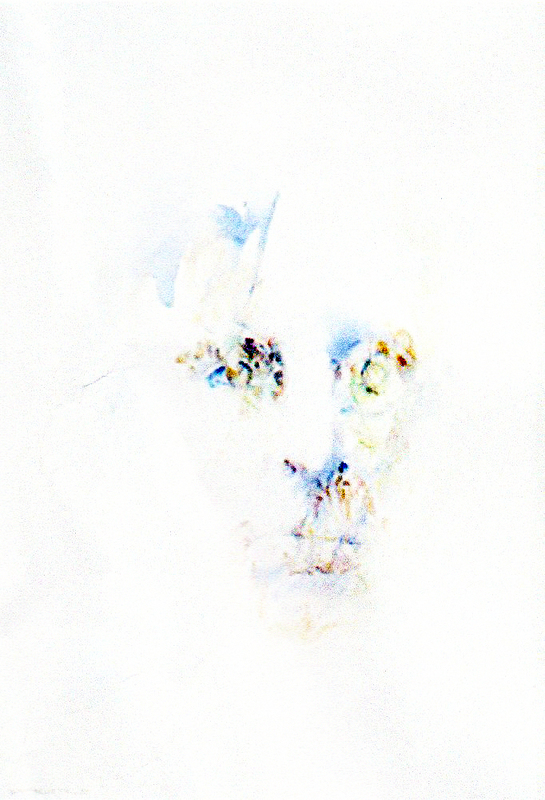 Oil paintings of Le Brocquy’s Portrait Head series were already attracting huge sums and beyond my reach but this was a possibility. This was attainable. There and then I decided to buy it and putting down a deposit of IR£100 arranged to pay it off in instalments. 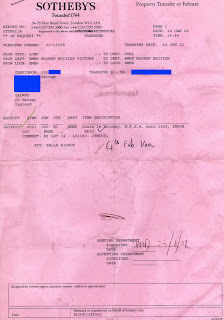 On the 10 March 1997 I paid off the last instalment and collected the painting from the gallery. I could not believe my good fortune and the excitement of bringing it back to Galway and hanging it in my office was enormous. The picture was a representation an ascetic Yeats, the Yeats of 1916 who penned a favourite poem of mine The Magi, the interpretation of which Louis Le Brocquy was to capture in the remainder of his Portrait Head series (up to that of Bono in 2002). 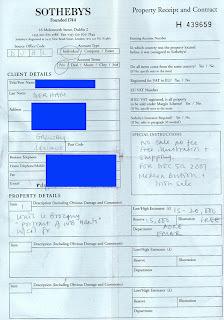 The joy of being responsible for a Le Brocquy was short-lived however. 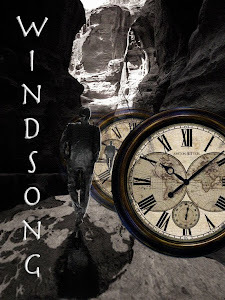 In 2001 we established a publishing company called Wynkin deWorde to publish literary fiction. Due mainly to my commercial ineptitude and the lack of a well worked-out business plan the banks would not lend us any money for the venture and thus it needed to be funded directly from my own resources. 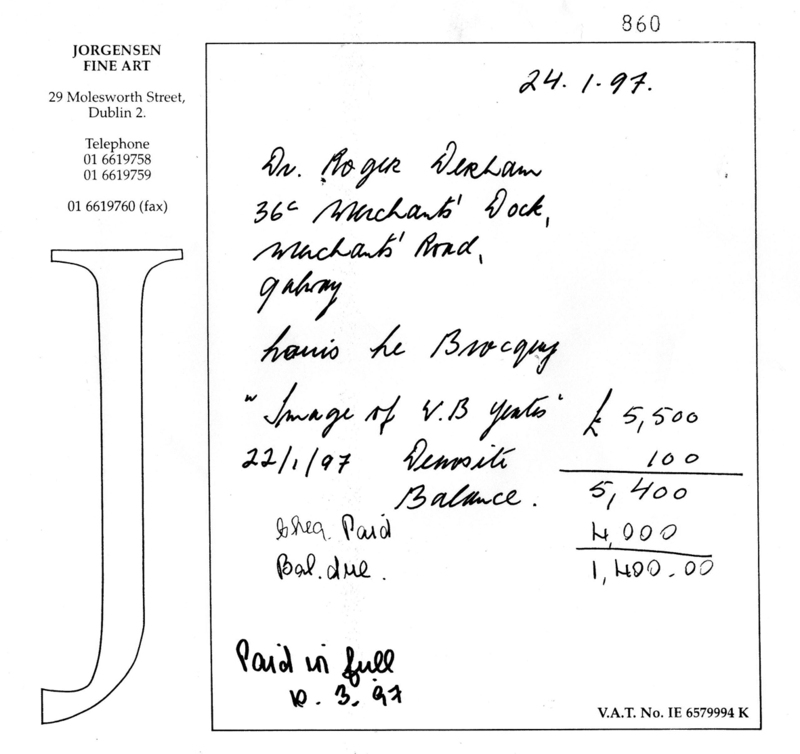 In May 2000 Le Brocquy’s early career Travelling Woman with Newspaper sold for €1.75 million and in September 2001 I approached Sotheby’s and asked them if they would consider selling my Yeats watercolour. 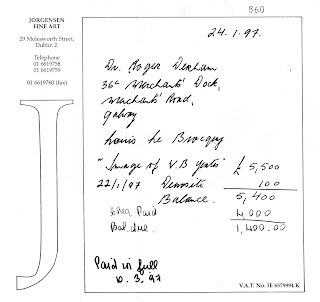 They were very enthusiastic and put a ‘conservative’ estimate of £15-20,000, which would have paid for our publishing production for the first year. Unfortunately the painting failed to reach its reserve in the British & Irish Modern sale of December 2001 and it was returned to me. 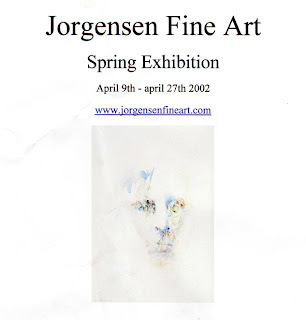 I still needed to get some seed capital and returned the painting to Ib Jorgenson’s gallery where it was eventually sold in April 2002 for about the same amount that I had paid for it five years earlier. I used to stare at the space on the wall of my office where it hung and wonder. Not with longing but with pleasure; the pleasure of having had the company for a short time of a piece of art that evoked my adolescence and spoke with an ancestral voice. Of a great fighting man. 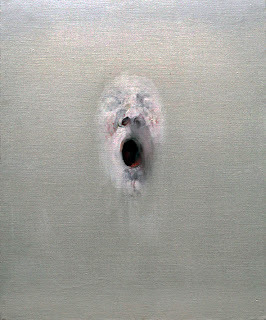 I’d like to think that 'out there' Louis Le Brocquy has a ‘soft feathery shape’.